The moment when the Sun is positioned directly over the Earth's equator, and the apparent position of the Sun at that moment. The time at which the vernal point, celestial equator, and other such elements are taken to be used in the definition of a celestial coordinate system—see Equinox (celestial coordinates). 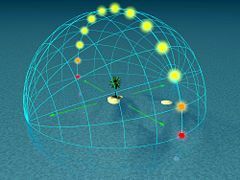 An equinox in astronomy is the moment in time (not a whole day) when the center of the Sun can be observed to be directly above the Earth's equator, occurring around March 20 and September 23 each year. More technically, at an equinox, the Sun is at one of two opposite points on the celestial sphere where the celestial equator (that is, declination 0) and ecliptic intersect. These points of intersection are called equinoctial points—the vernal point and the autumnal point. By extension, the term equinox may be used to denote an equinoctial point. There is either an equinox (autumn and spring) or a solstice (summer and winter) on approximately the 21st day of the last month of every quarter of the calendar year. On a day which has an equinox, the centre of the Sun will spend a nearly equal amount of time above and below the horizon at every location on Earth and night and day will be of nearly the same length. 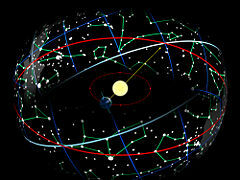 The word equinox derives from the Latin words aequus (equal) and nox (night). In reality, the day is longer than the night at an equinox. Commonly, the day is defined as the period that sunlight reaches the ground in the absence of local obstacles. From Earth, the Sun appears as a disc and not a single point of light; so, when the centre of the Sun is below the horizon, the upper edge is visible. Furthermore, the atmosphere refracts light; so, even when the upper limb of the Sun is below the horizon, its rays reach over the horizon to the ground. In sunrise/sunset tables, the assumed semidiameter (apparent radius) of the sun is 16 minutes of arc and the atmospheric refraction is assumed to be 34 minutes of arc. Their combination means that when the upper limb of Sun is on the visible horizon its center is 50 minutes of arc below the geometric horizon, which is the intersection with the celestial sphere of a horizontal plane through the eye of the observer. These effects together make the day about 14 minutes longer than the night at the equator, and longer still at sites toward the poles. The real equality of day and night only happens at places far enough from the equator to have at least a seasonal difference in day length of 7 minutes, and occurs a few days towards the winter side of each equinox. March equinox and September equinox. An alternative to the previous set, but without the ambiguity for which hemisphere they are intended. These names are still not universal, however, as not all people on Earth use a solar-based calendar where the equinoxes occur every year in the same month (they differ in the Hebrew calendar, for example). The names are also not useful for other planets (Mars, for example), even though they have seasons. Vernal equinox and autumnal equinox. These names are direct derivatives of Latin (ver = spring, autumnus = autumn), and as such more apt to be found in writings. Although in principle they are subject to the same problem as the spring/autumn names, their use over the centuries has fixed them to the viewpoint of the northern hemisphere. As such the vernal equinox is the equinox where the Sun passes from south to north, and is a zero point in some celestial coordinate systems. The name of the other equinox is used less often. Vernal point and autumnal point. 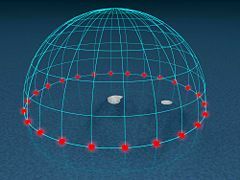 These are the points on the celestial sphere where the Sun is located on the vernal equinox and, respectively, on the autumnal equinox. Northward equinox and southward equinox. Names referring to the apparent motion of the Sun at the times of the equinox. The Earth's seasons are caused by the rotation axis of the Earth not being perpendicular to its orbital plane. The Earth's axis is tilted at an angle of approximately 23.44° from the orbital plane. This tilt is called the axial tilt. 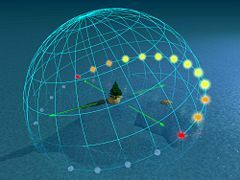 As a consequence, for half a year (from around 20 March to around 22 September) the northern hemisphere tips toward the Sun, with the maximum around 21 June, while for the other half year the southern hemisphere has this honor, with the maximum around 21 December. 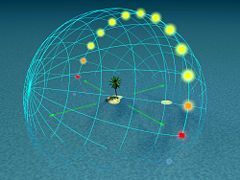 The two instances when the Sun is directly overhead at the equator are the equinoxes. Also at that moment both the north pole and south pole of the Earth are just on the terminator, and day and night are divided equally between the hemispheres. Because the Sun is a sphere and not a point source of light, the actual crossing of the Sun over the equator takes approximately 33 hours. At the equinoxes, the rate of change for the length of daylight and nighttime is the greatest. At the poles, the equinox marks the transition from 24 hours of nighttime to 24 hours of daylight. High in the Arctic Circle, Longyearbyen, Svalbard, Norway has an additional 15 minutes more daylight every day around the time of the Spring equinox. Whereas, in Singapore, which lies virtually on the equator, the amount of daylight each day varies by just seconds. Currently the most common equinox and solstice dates are March 20, June 22, September 22, and December 21, the four year average will slowly shift to earlier times in the years to come. This shift is a full day in about 70 years (largely to be compensated by the century leap year rules of the Gregorian calendar). But that also means that in many years of the twentieth century the dates of March 21, June 22, September 23, and December 22, were much more common, so older books teach, and older people still remember, these dates as the main ones. Note that the times are given in UTC, roughly speaking, the time at Greenwich (ignoring British Summer Time). People living farther to the east (Asia, Australia) whose local times are in advance, will see the seasons apparently start later, for example in Tonga (UTC+13) an equinox occurred on September 24, 1999; a date which will not happen again until 2103. On the other hand people living far to the west (America) have clocks running behind in time, and may experience an equinox occurring as early as March 19. The explanation given in the previous section would be useful for an observer in outer space. As seen by an observer on Earth, it may appear to the casual observer that the Sun revolves around the Earth once a year. As such, in the half year centered around June it rises and sets more towards the north, which means longer days and shorter nights for the northern hemisphere and shorter days and longer nights for the southern hemisphere. In the half year centered around December the Sun rises and sets more towards the south, and the day and night durations are reversed. Also, on the equinox day, the Sun rises, for every place on Earth (except at the poles), at 6:00 in the morning and sets at 18:00 in the evening local time. But these times are not exact for several reasons. Sunrise and sunset are commonly defined for the upper limb of the solar disk, and not for its center. The upper limb is already up for at least one minute before the center appears, and likewise the upper limb sets one minute later than the center of the solar disk. Height of the horizon on both the sunrise and sunset sides changes the day's length. Going up into the mountains will lengthen the day, while standing in a valley with hilltops on the east and the west can shorten the day significantly. This is why settlements in east-west running valleys are more favorable (daylight-wise) than north-south running valleys. Some of the above statements can be made clearer when picturing the day arc: the path the Sun tracks along the celestial dome in its diurnal movement. The pictures show this for every hour on equinox day. In addition, also some "ghost" suns are indicated below the horizon, up to 18° down. The Sun in this area still causes twilight. The pictures can be used for both the northern and the southern hemisphere. The observer is supposed to sit near the tree on the island in the middle of the ocean. The green arrows give the cardinal directions. Because of the precession of the Earth's axis, the position of the vernal point changes over time and as a consequence both the equatorial and the ecliptic coordinate systems change over time. Therefore, when specifying celestial coordinates for an object, one have to specify at what time the vernal point (and also the celestial equatorial) are taken. That reference time is also called equinox. For Western tropical astrology, the same thing holds true; the vernal equinox is the first point (such as, the start) of the sign of Aries. 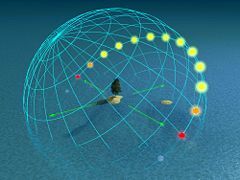 In this system, it is of no significance that the fixed stars and equinox shift compared to each other due to the precession of the equinoxes. The Persian new year, Nowruz, is held annually on the vernal equinox, as the beginning of spring. Sham El Nessim was an ancient Egyptian holiday which can be traced back as far as 2700 B.C.E. It is still one of the public holidays in Egypt. Sometime during Egypt's Christian period (c.200-639) the date moved to Easter Monday, but before then it coincided with the vernal equinox. The Jewish Passover always falls on the full moon following the northern hemisphere vernal equinox. The Christian churches calculate Easter as the first Sunday after the first full moon on or after the March equinox. The official church definition for the equinox is March 21. However, as the Eastern Orthodox Churches use the older Julian calendar, while the Western Churches use the Gregorian calendar, both of which designate March 21 as the equinox, the actual date of Easter differs. The earliest possible Easter date in any year is therefore March 22, on each calendar. The March equinox marks the first day of various calendars including the Iranian calendar and the Bahá'í calendar. The Persian (Iranian) festival of Nowruz is celebrated then. According to the ancient Persian mythology Jamshid, the mythological king of Persia, ascended to the throne on this day and each year this is commemorated with festivities for two weeks. These festivities recall the story of creation and the ancient cosmology of Iranian and Persian people. It is also a holiday for Azerbaijan, Afghanistan, India, Turkey, Zanzibar, Albania, and various countries of Central Asia, as well as among the Kurds. As well as being a Zoroastrian holiday, it is also a holy day for adherents of the Bahá'í Faith and the Nizari Ismaili Muslims. The September equinox marks the first day of Mehr or Libra in the Iranian calendar. It is one of the Iranian festivals called Jashne Mihragan, or the festival of sharing or love in Zoroastrianism. 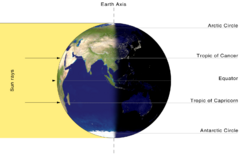 The traditional East Asian calendars divide a year into 24 solar terms (節氣, literally "climatic segments"), and the vernal equinox (Chūnfēn, Chinese and Japanese: 春分; Korean: 춘분; Vietnamese: Xuân phân) and the autumnal equinox (Qiūfēn, Chinese and Japanese: 秋分; Korean: 추분; Vietnamese: Thu phân) mark the middle of the spring and autumn seasons, respectively. In this context, the Chinese character 分 means "division" (within a season). In Japan, (March) Vernal Equinox Day (春分の日 Shunbun no hi) is an official national holiday, and is spent visiting family graves and holding family reunions. Similarly, in September, there is an Autumnal Equinox Day (秋分の日 Shūbun no hi). The Mid-Autumn Festival is celebrated on the 15th day of the 8th lunar month, and is an official holiday in many East Asian countries. As the lunar calendar is not synchronous with the Gregorian calendar, this date could be anywhere from mid-September to early October. Tamil and Bengali New Years follow the Hindu zodiac and are celebrated according to the sidereal vernal equinox (14 April). The former is celebrated in the South Indian state of Tamil Nadu, and the latter in Bangladesh and the East Indian state of West Bengal. For a Latin word like nox the plural is noctēs. Although this root is retained in English in the adjective: Equinoctial—it is not commonly used for the plural, which is equinoxes, rather than equinoctes. One effect of equinoctial periods is the temporary disruption of communications satellites. For all geostationary satellites, there are a few days near the equinox when the sun goes directly behind the satellite relative to Earth (ie, within the beam width of the ground station antenna) for a short period each day. The Sun's immense power and broad radiation spectrum overload the Earth station's reception circuits with noise and, depending on antenna size and other factors, temporarily disrupt or degrade the circuit. The duration of those effects varies but can range from a few minutes to an hour. (For a given frequency band, a larger antenna has a narrower beam width, hence experience shorter duration "Sun outage" windows). A folk tale claims that only on the March equinox day (some may add the September equinox day or may explicitly not), one can balance an egg on its point. However, one can balance an egg on its point any day of the year if one has the patience. Although the word "equinox" implies equal length of day and night, as is noted elsewhere, this is not true. For most locations on earth, there are two distinct identifiable days per year when the length of day and night are closest to being equal. Those days are commonly referred to as the "equiluxes" to distinguish them from the equinoxes. Equinoxes are points in time, but equiluxes are days. By convention, equiluxes are the days where sunrise and sunset are closest to being exactly 12 hours apart. This way, you can refer to a single date as being the equilux, when, in reality, it spans sunset on one day to sunset the next, or sunrise on one to sunrise the next. The equilux counts times when some direct sunlight could be visible, not all hours of usable daylight, which is anytime there is enough natural light to do outdoor activities without artificial light. This is due to twilight, and this part of twilight is officially defined as civil twilight. This amount of twilight can make there be more than 12 hours of usable daylight up to a few weeks before the spring equinox, and up to a few weeks after the fall equinox. On the contrary, the intensity of light near sunrise and sunset, even with the sun slightly above the horizon, is considerably less than when the sun is high in the sky. The daylight which is useful for illuminating day lit houses and buildings and for producing the full psychological benefit of daylight is shorter than the nominal time between sunrise and sunset, and is present for 12 hours only after the vernal equinox and before the autumnal equinox. ↑ Anthony Aveni, "Spring Equinox: Watching the Serpent Descend," The Book of the Year: A Brief History of Our Seasonal Holidays (Oxford: Oxford University Press, 2003, ISBN 9780195150247), 47-61. ↑ www.bahai.us, Baha'i calendar. Retrieved September 6, 2008. ↑ The Ismaili, The Ismaili: Navroz. Retrieved September 6, 2008. ↑ Snopes, Infernal Egguinox. Retrieved September 6, 2008. ↑ De-Fact-O, The equinox allows you balance an egg on its point. Retrieved September 6, 2008. Aveni, Anthony. 2002. Empires of Time: Calendars, Clocks, and Cultures. Boulder, CO: University Press of Colorado. ISBN 0870816721. Aveni, Anthony. 2003. The Book of the Year: A Brief History of Our Seasonal Holidays. Oxford, UK: Oxford University Press. ISBN 9780195150247. Evans, James. 1998. The History and Practice of Ancient Astronomy. New York: Oxford University Press. ISBN 0195095391. Details about the Length of Day and Night at the Equinoxes. Table of times for Equinoxes, Solstices, Perihelion, and Aphelion in 2000-2020. Table of times of Spring Equinox for a thousand years 1452-2547. Ancient Equinox Alignment. Loughcrew, Ireland. This page was last modified on 18 August 2017, at 21:14.